Out of all the Netflix Originals, some stand above the rest. Whether it’s due to their action, the storytelling, the character development, or all of the above, some shows are just more enjoyable to watch. In 2016, the streaming service came out with one of its most ambitious shows yet, Stranger Things. The show did so well, that they almost immediately renewed it for season two. 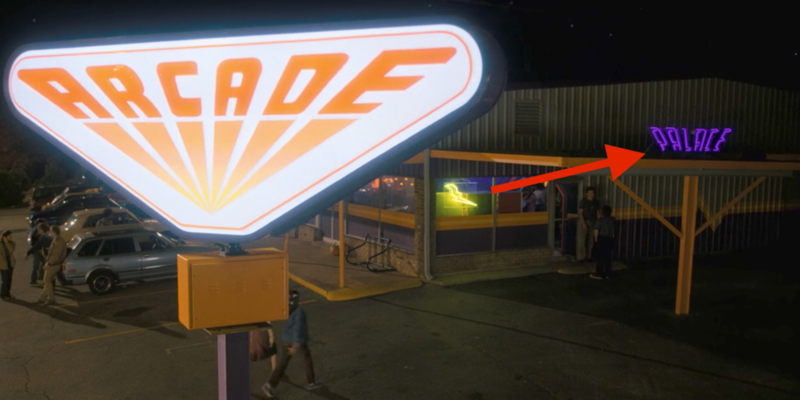 One of the great features of Stranger Things are all the retro references. Did you catch all these ’80s references from the second season? Tom Cruise fans might have caught this one right away, but if not this is a pretty cool retro throwback. On the night of Halloween, everyone’s dressed up and the cute couple decided to pay homage to an oldie but goodie Cruise film. 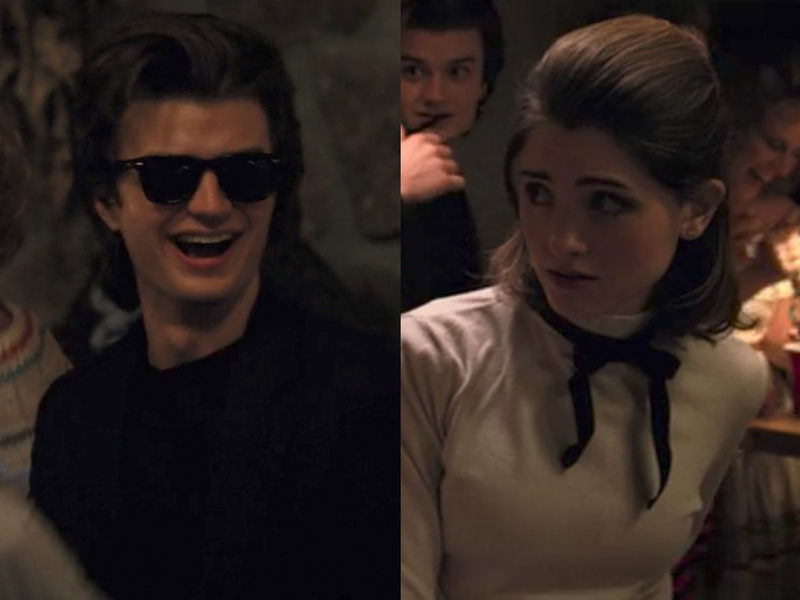 Steve and Nancy showed up to the party dressed as the main characters from Risky Business. They pulled off this Joel and Lana look quite well too. A perfect couple’s outfit that was very ’80s. To keep 11 safe from the outside world and the “bad people” looking for her, Officer Hopper took her in to take care of her. The trade-off was that 11 wasn’t able to really go outside without strict supervision, so for Halloween, Hopper dressed her up in a sheet with holes. This is the exact costume E.T. wore on Halloween when he went out to go trick-or-treating. 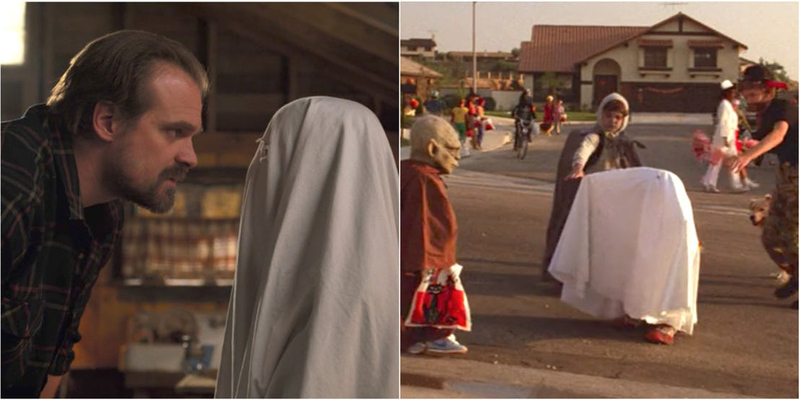 The big difference here is that Hopper didn’t take the young girl out for candy! Joyce Byers (Winona Ryder) finds a new love interest for the second season of Stranger Things and his name is Bob (Sean Astin). Astin is also from one of the most well-known ’80s films, The Goonies, but he was just a young kid at the time. Bob’s character story pretty much walks the same line as Mikey’s from The Goonies. For one, he figures out how to read the map, then he doesn’t want to depart from the tunnels until everyone is safe. Sounds familiar, right? This reference was quick, so that made it harder to notice even if you were watching closely. 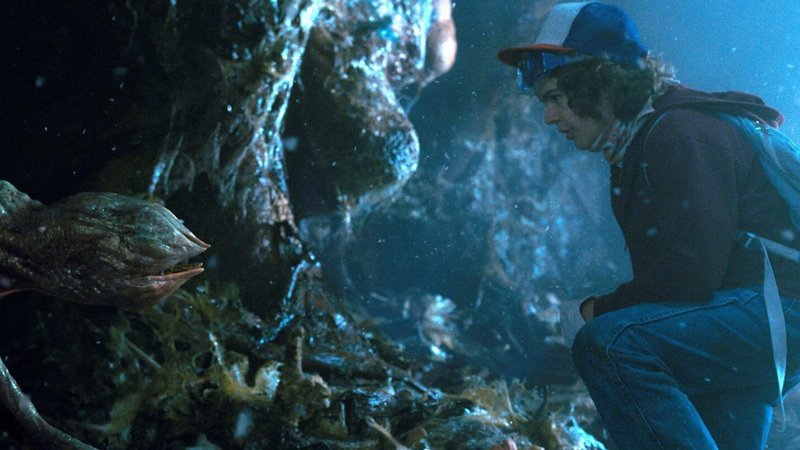 Once Hopper lands in the tunnels where all the Demogorgon reside, he finds out that the Upside Down world is leaking into Hawkins. Rewind to when Hopper lands. His hat falls off of him as he’s looking around in the tunnel with confusion. 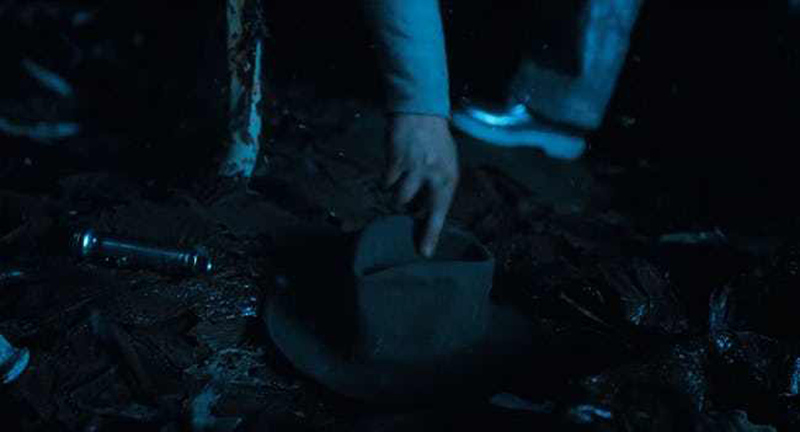 He then starts to run away, but not before grabbing his hat, Indiana Jones style. The Duffer Brothers said this was a last-minute decision they added in for a retro throwback moment. 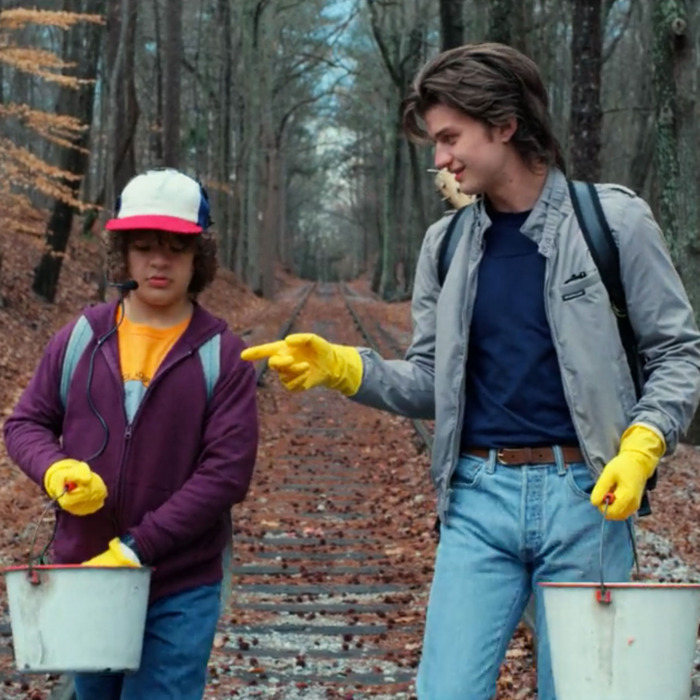 Steve and Dustin became pretty good friends during the second season. Well, that was because they kind of had to start working together, but their bonding time brought them to the train tracks. Steve and Dustin are out there leaving raw meat so they can try and catch the loose demodog that Dustin found in his home. They’re walking down the tracks just like the kids from Stand By Me. This is also the scene that brought these two characters closer together. 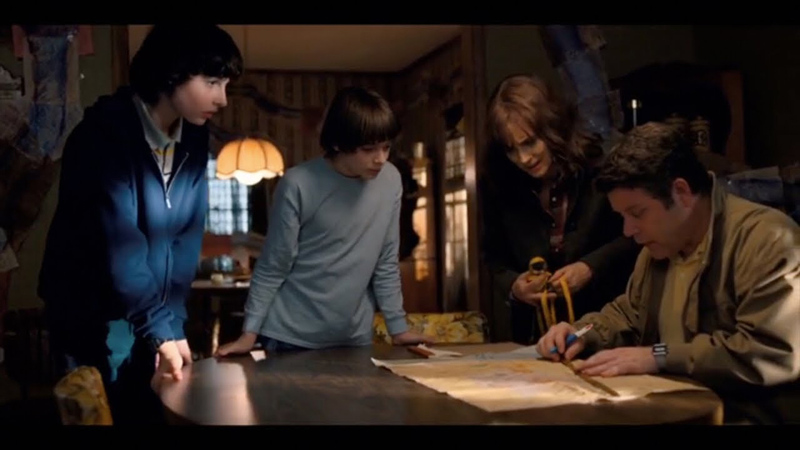 Will Byers had the power to see the upside down dimension thanks to the events that unraveled in season one. All that means is that he was able to see all the scary stuff that was in the other world but out in the real world. This might be a late ’70s reference, but it was still buzzing and popular in the ’80s. Will looks out the open door very reminiscent of Steven Spielberg’s Close Encounters flick. Both scenes have stellar execution. At the beginning of the season, Dustin discovers a baby demodog in a dumpster near his home. Unaware that it was a human eating creature, he decides to take it in and nurture it like a pet. This whole plotline stems straight from Gremlins. Stranger Things really loves paying homage. Fans of St. Elmo’s Fire might have caught this one right away, but everyone else just thought Billy was just an ordinary character addition. 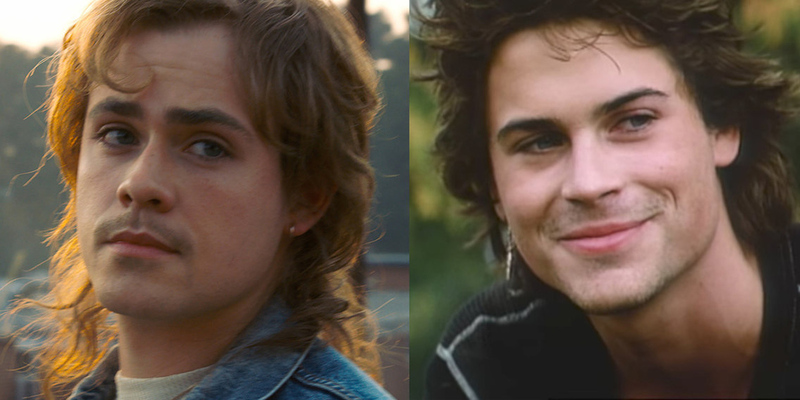 Billy looked just like Rob Lowe’s character from St. Elmo’s Fire. The miraculous mullet, the single earring, and the overall facial appearance hit the nail on the head. It’s almost frightening how close they mirror each other when you look at the side-by-side image of them. This is as ’80s as it gets. The Terminator came out on October 26, 1984, bringing forth a new trend in movie subject matter. 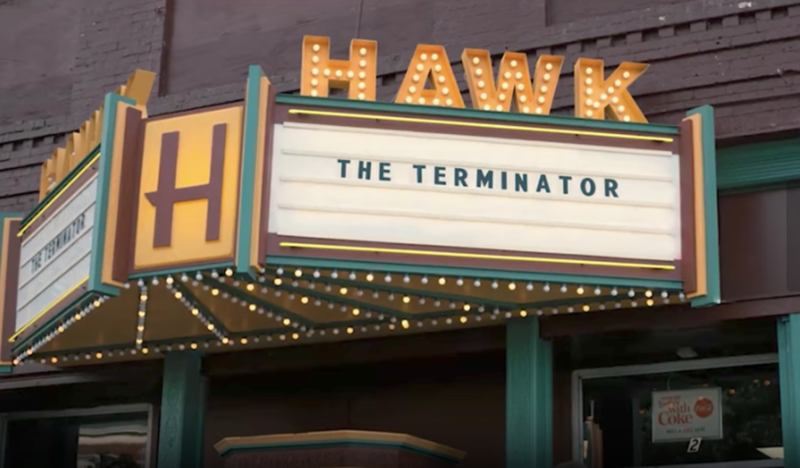 The Hawk theater located in Hawkins showcased this movie as showing at their theater. This probably would have been the exact weekend that the film came out in the show’s timeline too. If the kids weren’t so busy with dangerous activities, they probably would have been at the movies during opening night in true nerd fashion. To start this season off, we see the boys hanging out at the Palace Arcade. It’s where fans get to meet one of the first new characters, Max, who later on becomes the love interest for Lucas. Right away, fans get hit with a reference that might not have been that easy to spot. The name of the arcade comes from the 1983 movie WarGames. Ross Duffer said that this was his favorite ’80s reference from the opening episode. On the front page of all the papers that parents from Hawkins seem to read you might have seen what looked like a random collection of words. “Baby Fae’s Baboon Heart” is on one side of the newspaper but this is a reference to a real thing. It’s the story of the first successful infant heart transplant. The procedure took place in October 1984. That would make it line up perfectly with the time the second season came out. One of the most obvious odes to the ’80s was what the boys wore as Halloween costumes. While Steve and Nancy paid homage to Tom Cruise and Risky Business, the Demogorgon hunters pulled off their best Ghostbusters impressions. Yes, the Ghostbusters had to battle their fair share of creepy creatures, we’re going to say that the kids from Hawkins had to deal with a lot more dangerous monsters. They get a pass for sporting these retro outfits. Earlier we discussed how Bob’s character arc is basically stripped right from The Goonies, so now let’s bring it back to another Goonies reference. 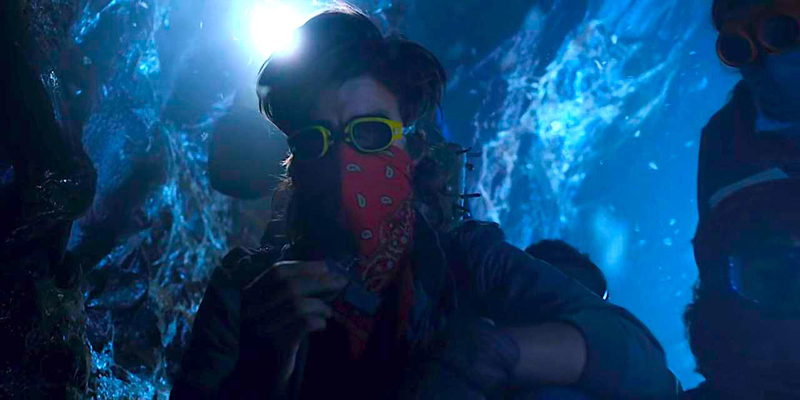 When the kids and Steve make their way to the tunnels where the demodogs are, they all have their different set of protective gear. This is where we notice Steve sporting the same bandanna that Josh Brolin had on. 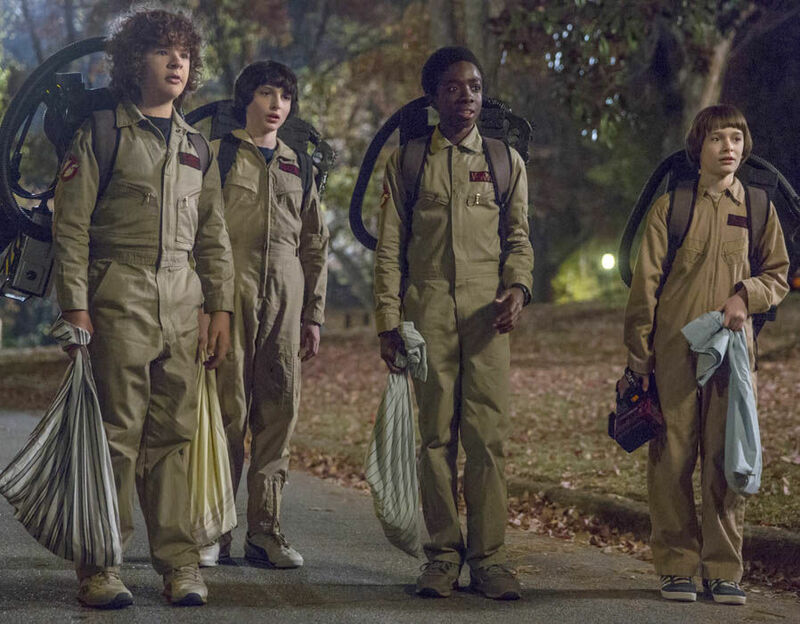 The Duffer brothers who created the series really wanted to bring in visual similarities with The Goonies to Stranger Things 2. Bob was an interesting character added into the series. He didn’t really seem like Joyce’s type, but he was the safe option after everything she had been through in season one. Bob worked at Radio Shack so he had all the cool gadgets. Out of the many nice toys he had, the JVC GR-C1 might have been the best. 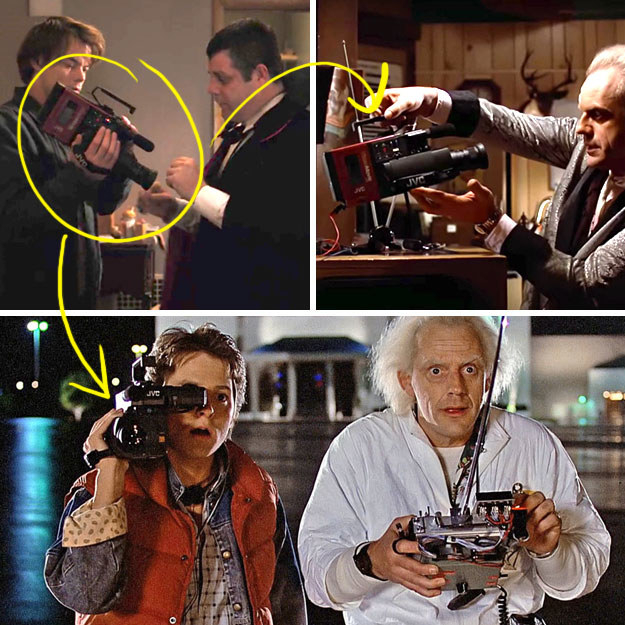 Not only because of the name but because it was the same camera that Marty McFly used to record the travel test! Newcomer Max made quite the impression on the group of kids right away. 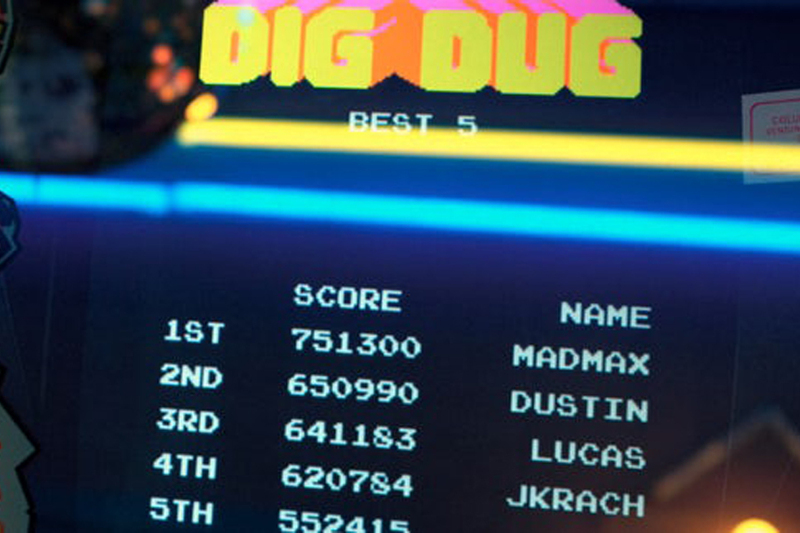 In the first episode, they meet her at the arcade where she’s playing their favorite game in which Dustin and Lucas held the two highest scores. Then, we notice that “MadMax” had taken over the top spot. That took the boys by total surprise. However, MadMax isn’t just her gamer name, it’s from the Mel Gibson films. One of the employees at the arcade even refers to her as “Road Warrior” which is another reference to the films. Speaking of the creepy and huge Mind Flayer, did that thing look familiar to anyone else? 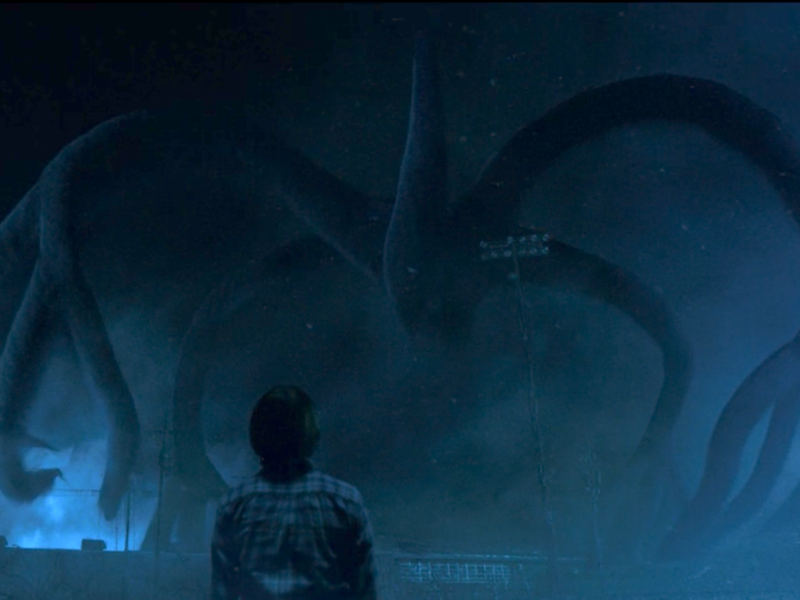 This horrifying beast that stalked the Upside Down realm looked awfully similar to the monsters from Stephen King’s The Mist. In that storyline, we see the creatures descend upon the city when the thick fog comes in. In Stranger Things, that’s pretty much the only thing that the Mind Flayer does, stalk through the fog. Still, it was a scary thing to behold. Nancy showed her affinity for Tom Cruise early on in season two with her Halloween costume. Thanks to Cruise enticing women the same way Zac Efron does in this modern era, Nancy had to have him displayed on her wall. He might not be as much as a heartthrob as he was back then, but he still attracts a decent amount of heart eyes from women. 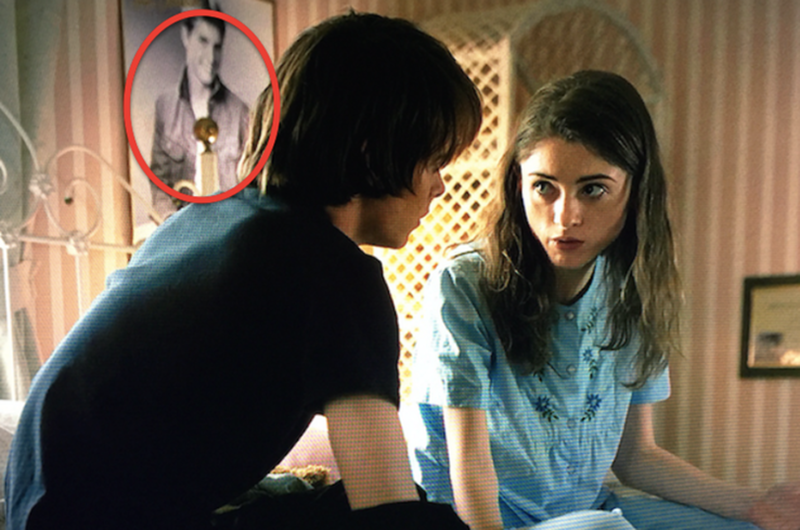 It was only right that Stranger Things had Nancy place the actor on her wall as a true symbol of the time period. With the release of so many iconic movies in the ’70s and ’80s, the Duffer brothers had a lot to work with. 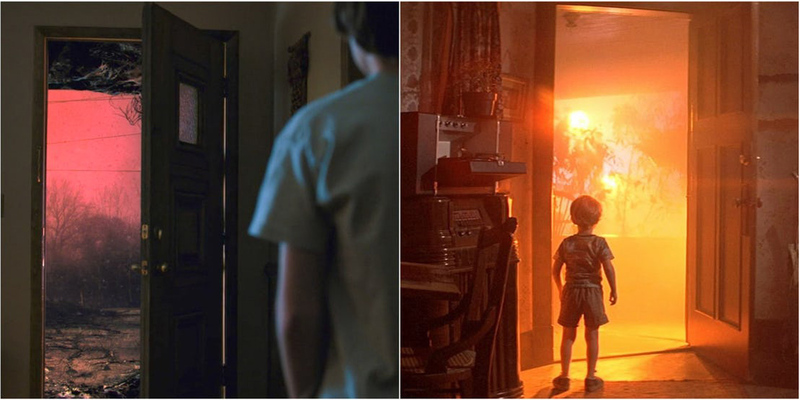 From the Terminator to Indiana Jones, the audience of Stranger Things sure got a blast from the past. One important film they had to include was Jaws. That’s why Will had a poster on his wall. 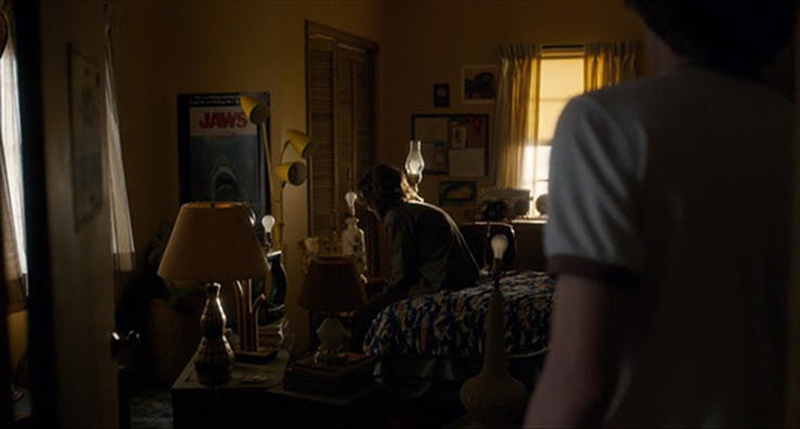 Many of the kids from the show had great movie posters on their walls, but the Jaws one is probably the most classic. Have you ever seen Pretty in Pink? Well, in the last episode of the season, Dustin becomes Duckie thanks to the situation that unravels at the dance. While Dustin and the boys attend the Snow Ball, everyone else seems to have someone to lean on. While he goes to sit down and fight back tears, a beautiful girl (Nancy) notices him and approaches. 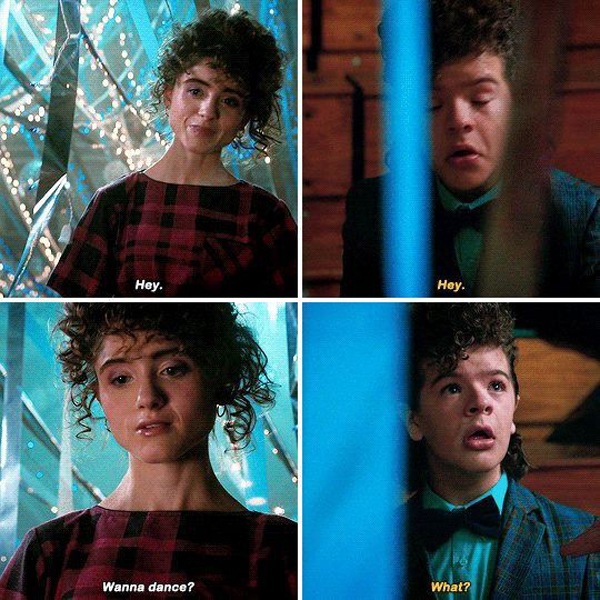 She asks for a dance and Dustin’s night turns around drastically. The same thing happened to Duckie when he realized he wouldn’t get the girl of his dreams. It’s a pretty iconic ’80s moment. One of the most intense moments from season 2 of Stranger Things is when Will has to face an exorcism. The Mind Flayer was inside of Will, so those close to him had to endure this horrifying moment as they expelled the evil entity from his body. The whole setup resembled that of The Exorcist. From the scary shrieks to the facial disfigurement, the possession was completely reminiscent of The Exorcist. People probably had nightmares thanks to that scene. Okay, you caught us The Exorcist premiered in 1973 but it’s still a cool reference.